At PSNStores, we are no stranger to 10tons Ltd. Over the past few years, the Finnish company have regularly put out quality games on Vita and PS4. 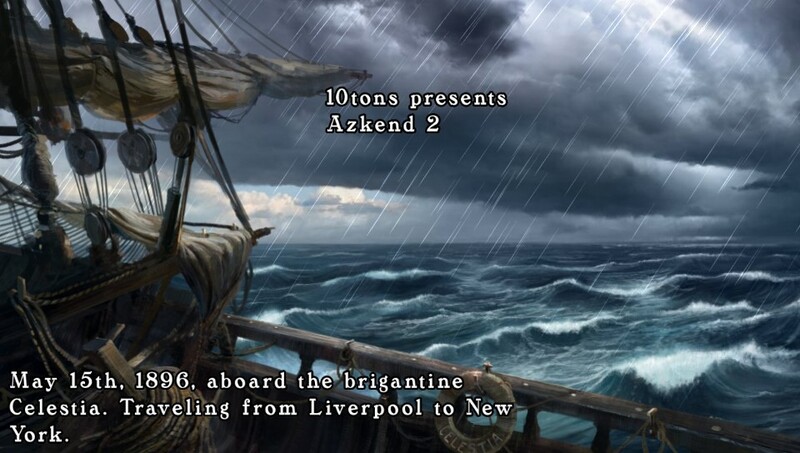 Azkend 2: The World Beneath doesn’t stray far from the gilded road 10tons have paved. 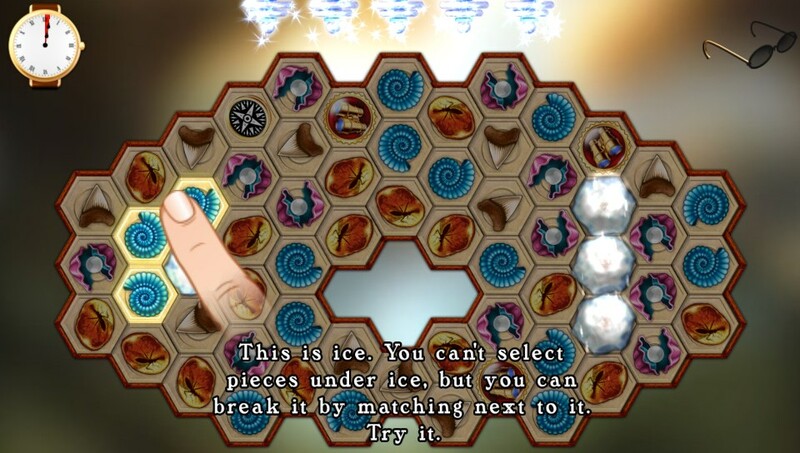 It’s a sliding match-3 (or more) puzzle game with some interesting mechanics and a side of hidden object game. 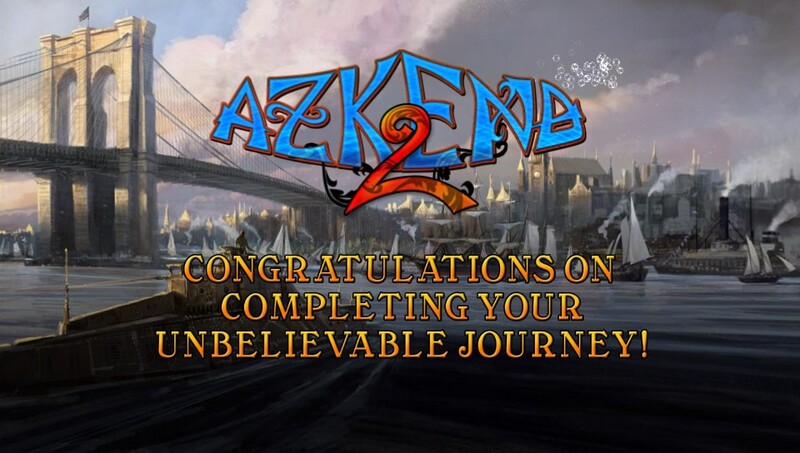 I played through the adventure and some of the challenges over the course of a weekend, tallying up around 3-4 hours of gameplay altogether. 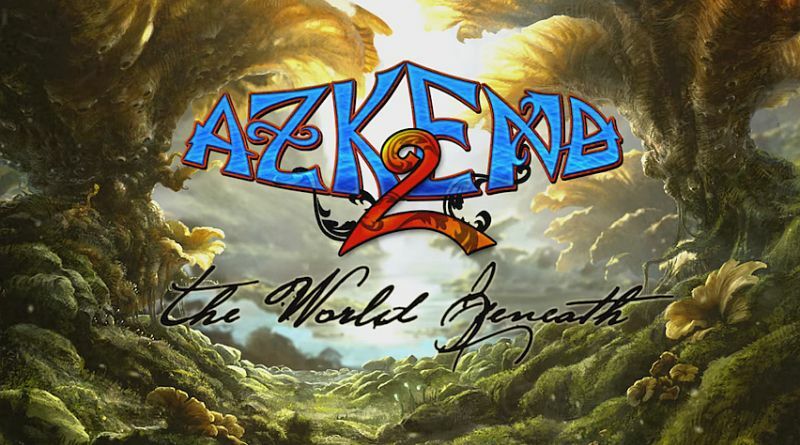 In Azkend 2, you play as a woman who is swept into a whirlpool and set on a magical journey beneath the world. 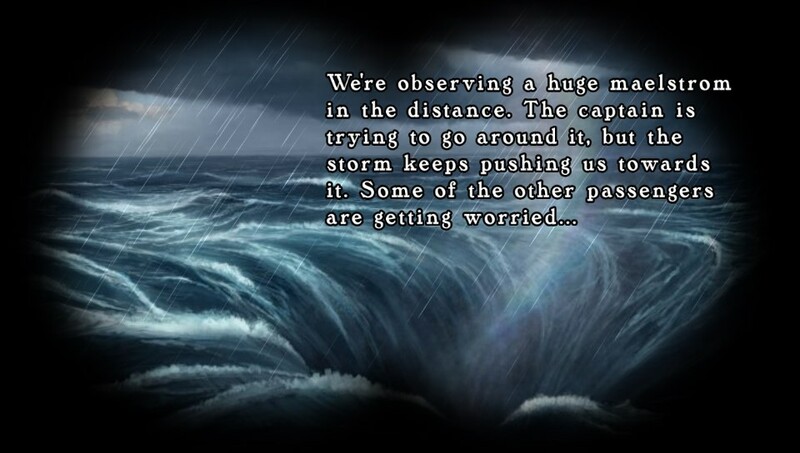 The story is told in between gameplay sections, typically with text, voice-over, and comic style still animations. 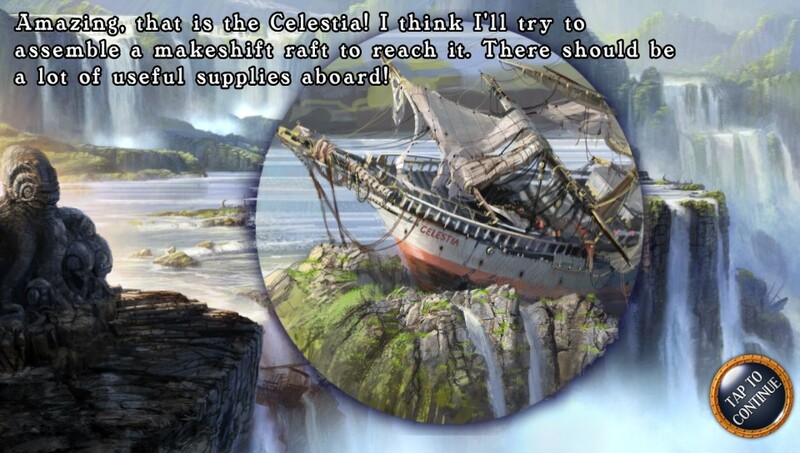 The voice acting is great; I often listened through a few of the blurbs even though I could read the text faster. 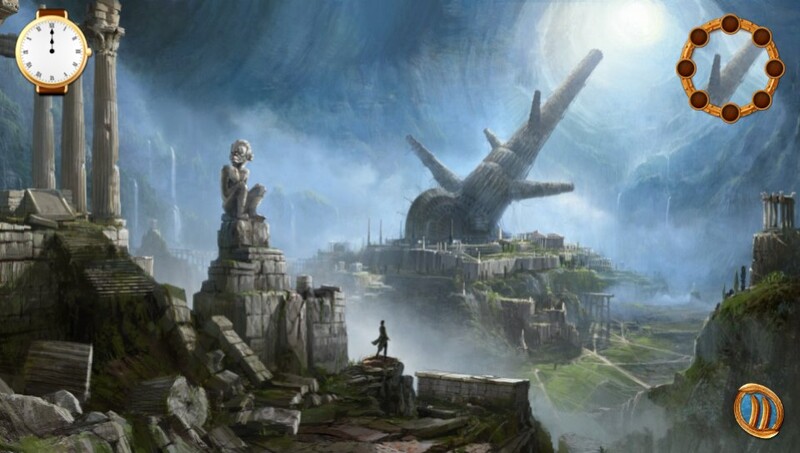 The art is also very high quality, which is important given the fact that this is partially a hidden object game. 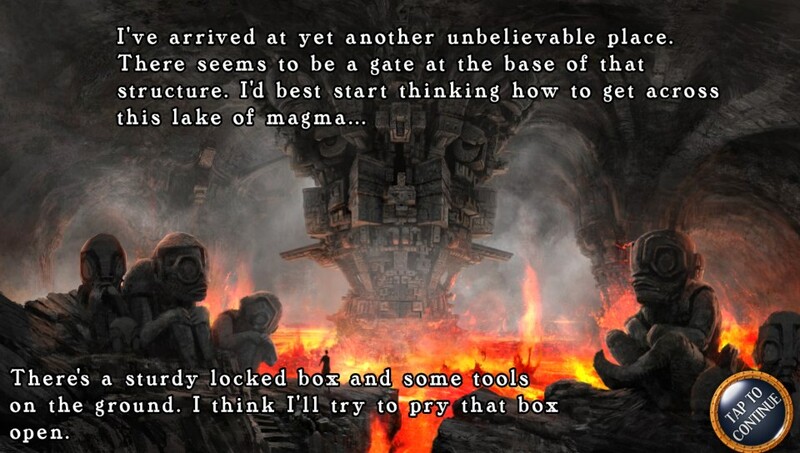 I was especially impressed by the sound design, specifically the music. Jonathan Geer‘s score is full of awe and discovery (also two of the song titles on the soundtrack). At points, I felt hints of Final Fantasy Tactics quality music, which is a feeling I don’t often get while playing most games. 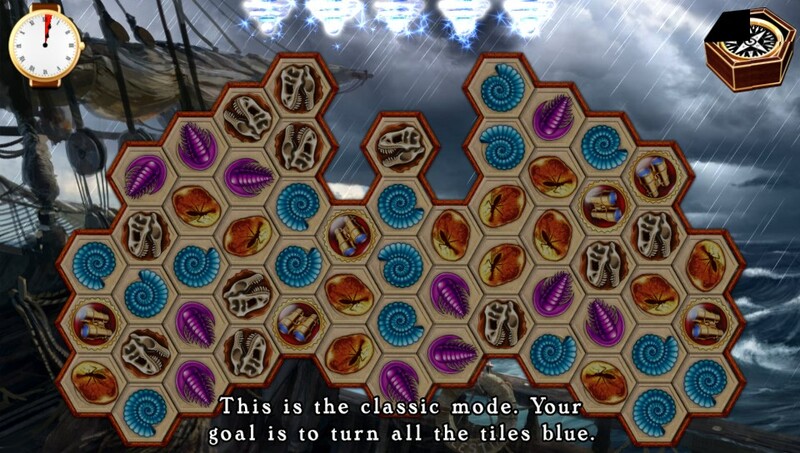 The bulk of the time in Azkend 2 will be spent matching tiles to complete objectives. 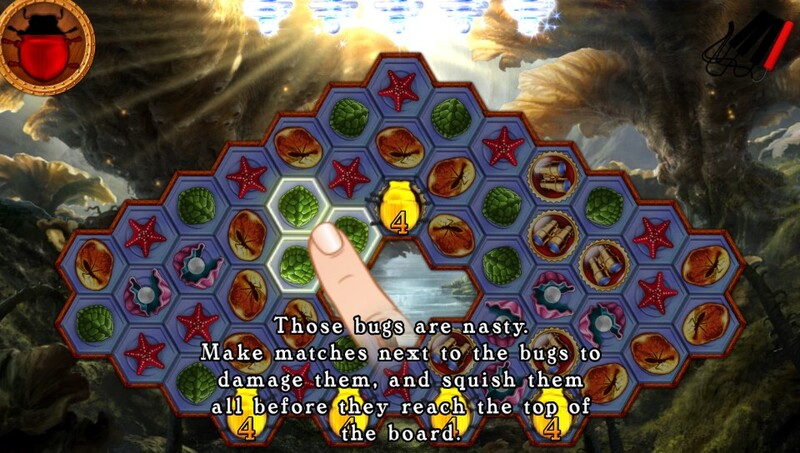 You slide your finger across three or more of the same type/color tile to remove them from the board. The first, simplest game mode tasks you to flip all of the background tiles from beige to blue. 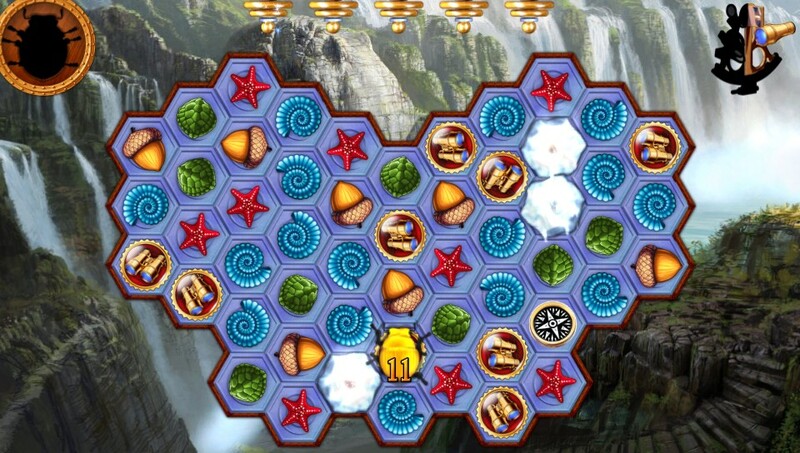 Later levels add another color, requiring you to flip from grey to beige then beige to blue. 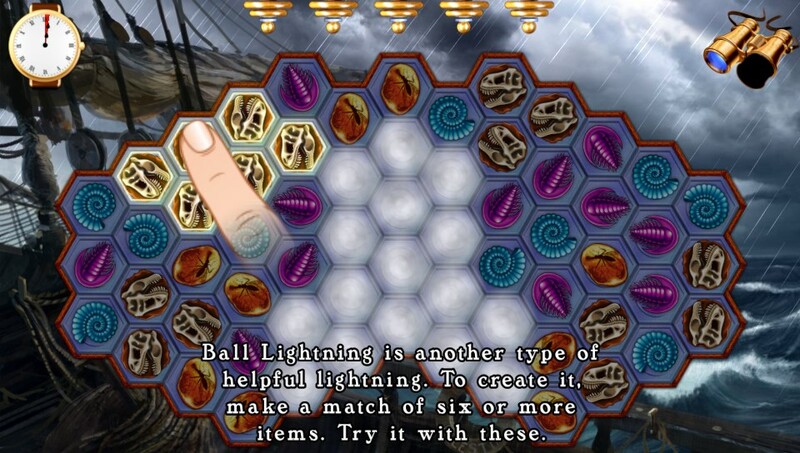 Each time you make a match that progresses the challenge, one of four tesla coils at the top of the screen charges. 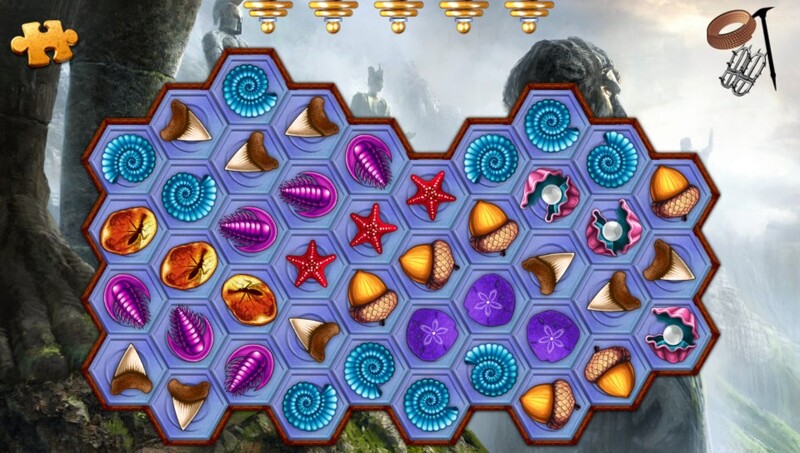 When all five are charged (you made five meaningful moves in a row), the coils zap tiles on the board, thrusting you ever closer to completing the level. 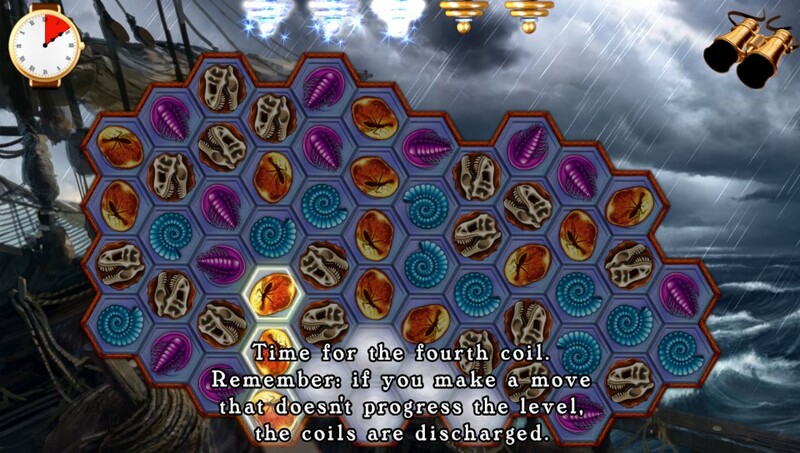 The coils are a subtle but interesting way to make player choices somewhat meaningful. I often second guessed a move because I knew I had three out of the five coils charged. On the same token, I sometimes purposefully made less valuable moves because only one of the coils was charged. 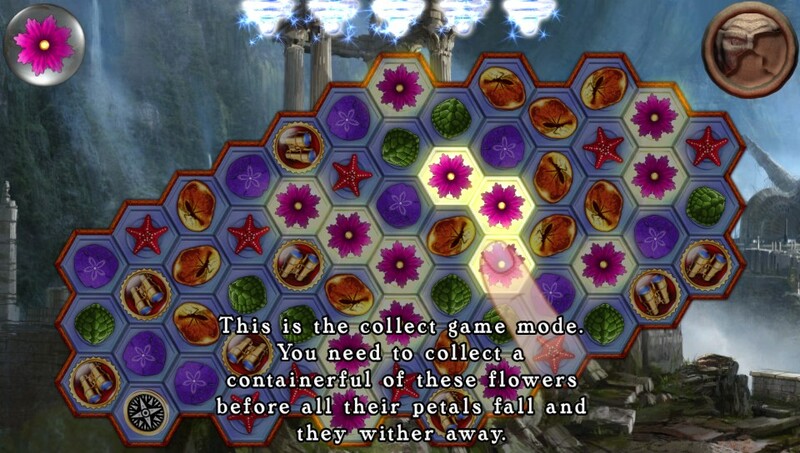 Other game modes require you to match specific flower tiles before their petals fall off, ward off an encroaching blaze, or remove tiles that are adjacent to specialty spots (locks, fog, bugs, etc.). 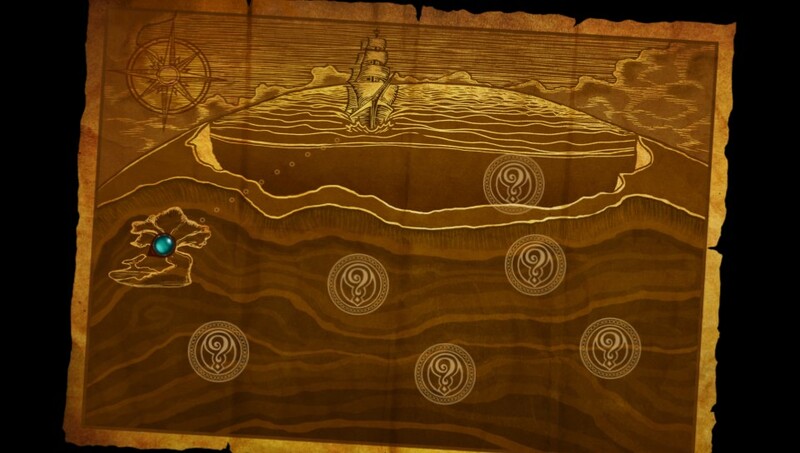 Making your way through the adventure will unlock active and passive power-ups. You can choose one of each to have equipped during a level, and they sometimes significantly change the game. When matched, the active power-up binoculars, for instance, will seek out and pop all idle tiles, making it easier to get more subsequent matches. 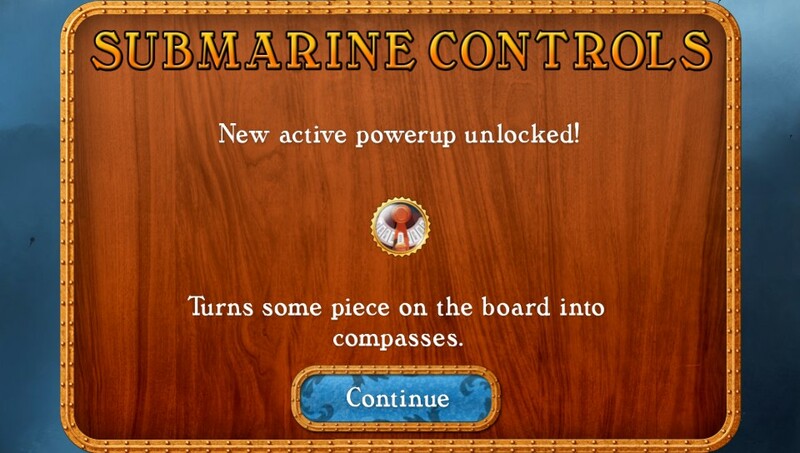 The maps passive power-up will populate the board with 15% more active power-ups. There are a handful of these to unlock in total. At one point, I thought I was clever for matching an active power-up that charges the coils with a passive that disallows the coils from discharging. It wasn’t as effective as I had hoped, and in the end I wondered why there wasn’t more synergy between some of the power-ups. 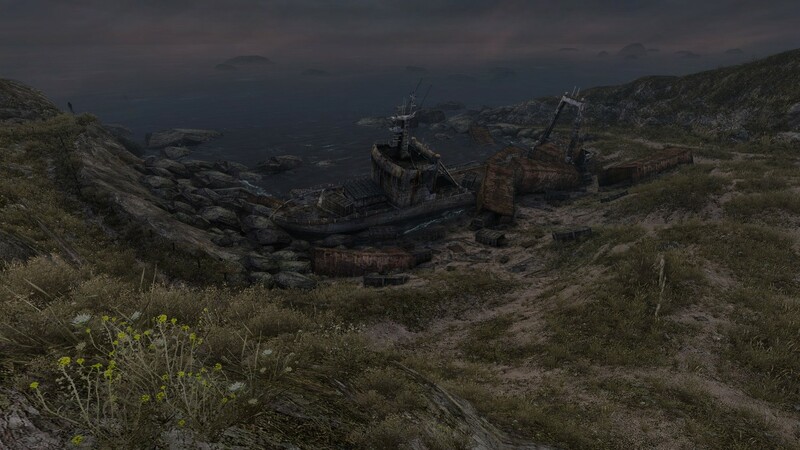 I also felt that some of the game modes weren’t fully developed. One in particular, puzzle, requires you to clear the entire field by matching specific bunches in certain sequences. They’re challenging and demand a lot of forethought, but I only remember playing three or four puzzles total. I don’t see myself spending much time on the challenges, as they’re essentially just replaying specific levels. If there were online leaderboards, I would consider playing the timed mode to get better at it. Overall, if you’re looking for a casual title on your Vita that offers some new ingredients to the match-3 formula, Azkend 2 may be for you. 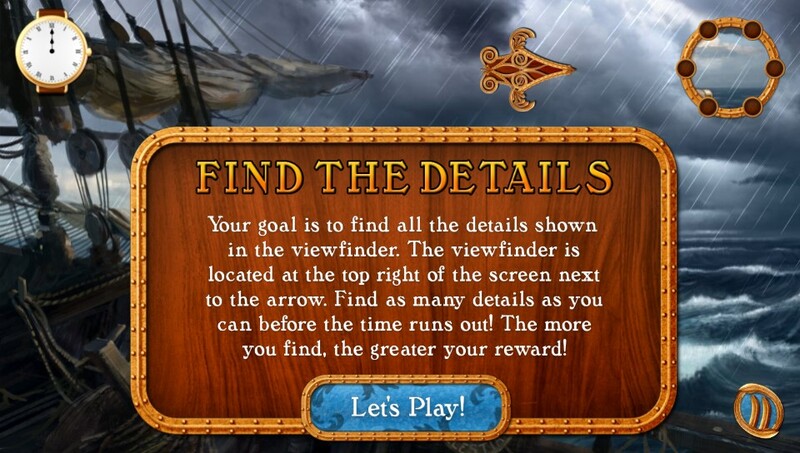 The hidden object sections are a natural addition to a touch-heavy game, and the core gameplay is challenging enough for pros and newcomers alike. 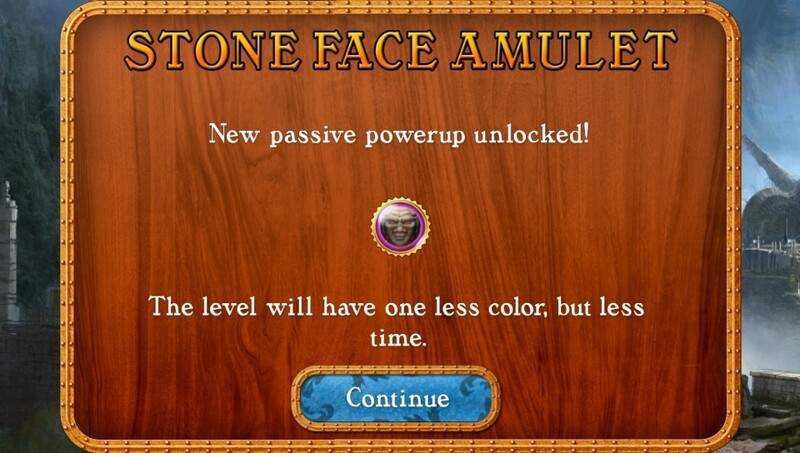 The different game modes and power-up unlocks add variety to an already robust experience. Lack of development of some game types. Challenges are just replaying the levels.